OAK PARK IL - The streets of downtown Oak Park will ring with the sounds of acoustic music on Thursday, August 16 from 5:00 - 9:00 pm. 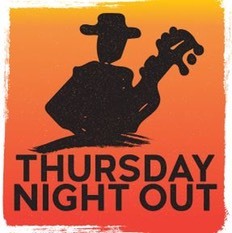 Music & Potlucks, a community organization based in the Oak Park River Forest area, is partnering with Downtown Oak Park to present three concerts for the popular Thursday Night Out series which runs from May 24 through August 30. The entertainment kicks off at 5:00 pm with Donna Herula Blues. Herula is a Chicago Blues Hall-of-Famer and will be joined by guitarist Tony Nardiello. www.donnaherula.com. At 6:00 pm the vibrant all-woman Americana trio $11 Supper takes the stage. Singer songwriters Michelle Billingsley, Amanda Healan and Samantha K. Mills are multi-instrumentalists and present sparkling originals, three part harmony and fresh arrangements. www.facebook.com/11dollarsupper. The Folk Park Showcase begins at 7:00 pm and will feature performances by octogenarian songstress Marge Weber from Elk Grove Village, IL and a special performance by Oak Park residents Lee and Nancy Pennington.